The deadline for registering to vote in the Scottish council elections is looming. People who want to cast their vote in the poll on Thursday 4 May have until midnight on Monday to register. 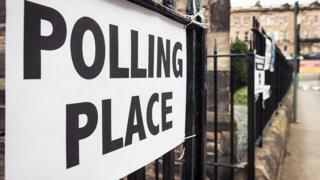 For the first time in a Scotland-wide council election, 16 and 17-year-olds will be eligible to vote. Andy O'Neill, the head of the Electoral Commission in Scotland, said anyone who is not registered by the end of Monday will not be able to vote. He said: "With only one day to go, time is running out to make sure you can take part in the Scottish council elections Thursday 4 May. "These elections are an opportunity to have a say on who represents local people on issues that directly affect day-to-day life such as education, housing and social care. "But if you're not registered by 17 April, you won't be able to vote." But that is not the case and everyone must register themselves individually. They can do so online at www.gov.uk/register-to-vote. The Electoral Commission is particularly keen to remind young people to register, and recently enlisted Snapchat in a bid to encourage them to sign up. It came after their research found that 69% of 18-34 year olds were correctly registered, compared to 96% of those aged over 65.